The Bourne Legacy producer Frank Marshall praises PH: "This is the most production-friendly country that we have visited"
In a TV Patrol interview, The Bourne Legacy’s Hollywood producers Frank Marshall and Pat Crowley-who also produced The Sixth Sense and Charlie’s Angels: Full Throttle-revealed that they were having a great time in the Philippines. The two said that while the film’s lead stars Jeremy Renner and Rachel Weisz can’t face the press just yet, they are certainly enjoyed Filipino culture. 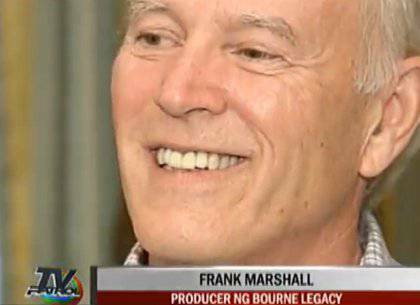 In a TV Patrol interview, The Bourne Legacy’s Hollywood producers Frank Marshall and Pat Crowley-who also produced The Sixth Sense and Charlie’s Angels: Full Throttle-revealed that they were having a great time in the Philippines. The two said that while the film’s lead stars Jeremy Renner and Rachel Weisz can’t face the press just yet, they are certainly enjoying Filipino culture. Marshall also commented on the warm reception the production team was given. "I always find it funny when we arrive in the morning and all the kids say, ’Hi, Pat!’ (referring to Crowley) This is the most production-friendly country that we have visited," he said. For his part, Crowley said that the film’s action sequences will be something to look forward to. He explained, "We're not going to tell you at all what the action sequences are going to be like but you will have never seen the things that we are doing." For more on this story, log on to ABS-CBNNews.com to watch the video of the TV Patrol interview.